4 bedroom, 2 bathroom villa in the The Manors at Westridge community. Owned by Jeff and Sandra Huckins. Ref: 3550. Jeff and I bought Palm Tree Villa in 2009, having owned another smaller home on the US192 since 2004. We first visited Florida in 1990, and stayed in a branch of a well known hotel chain near International Drive - never again! Apart from the accommodation we just fell in love with Florida, and returned two years later when we stayed in a friends condo. We realised that it was much nicer to have a comfortable base than to stay in a hotel with just the basic amenities, so continued to visit, staying in rented villas and apartments. Once our daughter was finished at university, and retirement was approaching we decided to take the plunge and bought our first home at Vista Del Lago, then bought our second one as an investment. We are fortunate enough to be able to visit two or three times a year, (I usually manage to slip in a weeks ladies only trip, almost every year! ), to keep on top of any maintenance issues, but we are lucky to have a great independent Management Company, who live two or three miles from the community. They have been taking care of both our Florida homes from the start. Because we visited so often before we first took the plunge we knew what people expected from a villa, and have tried to exceed those expectations wherever possible. The only extra we charge for is pool heat - wherever possible we try to accommodate any reasonable requests from guests - for example I made sure the World Cup was available in summer 2014! We now have guests returning for the second, third and fourth time so I would like to think we are getting it right! For privacy reasons, the marker on the map shows the The Manors at Westridge community location and not actual villa location. The villa, which is almost 2000 sq feet in size, has a split floor plan, with four bedrooms, a large ensuite master bathroom and closet, and separate guest bathroom. It has a private screened pool with extended deck and a green belt area to the rear. There is external lighting on the deck, and underwater lighting in the pool, and there is all weather furniture including recliners,loungers and patio dining set on the deck itself. 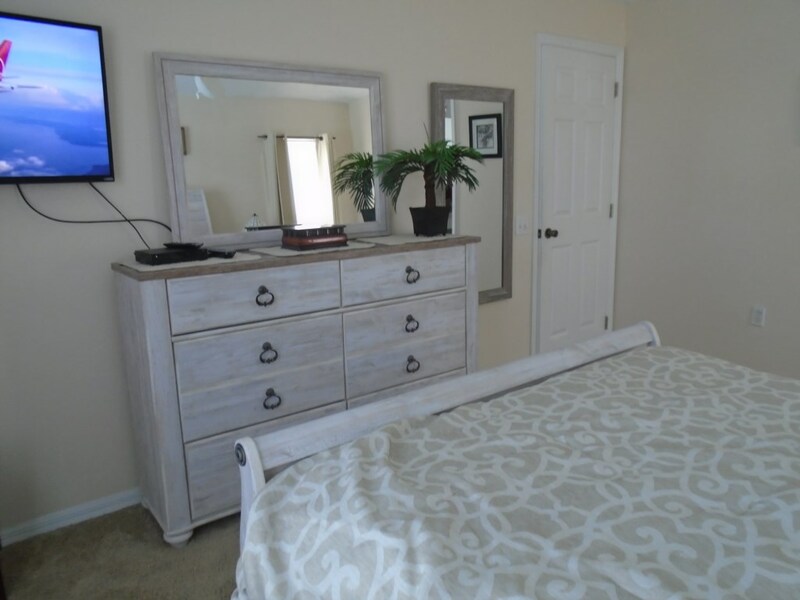 There are two living areas, 50" 4K Smart TV in the family room, 40" HD TV in the formal lounge, 40" Smart TV in the master bedroom and 19" TV's in all remaining bedrooms, plus numerous extras at no extra charge. 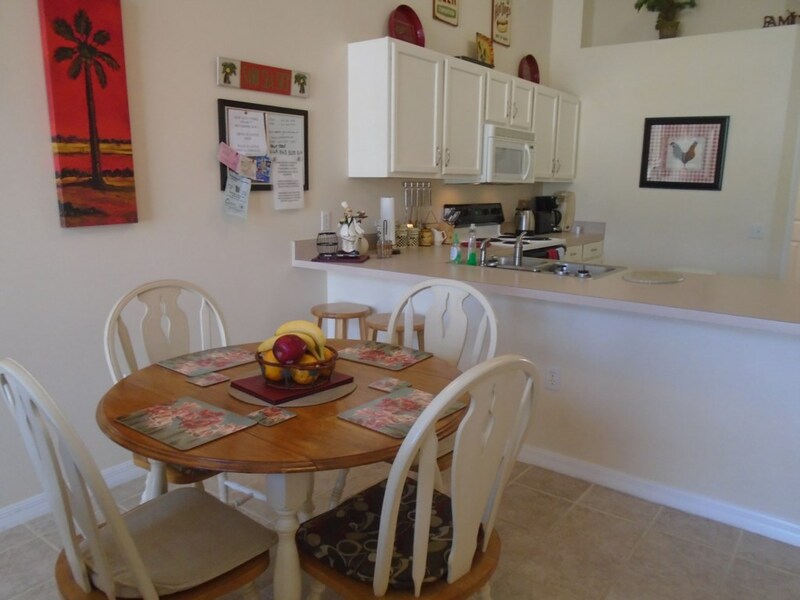 Easy access to Interstate 4 and the US 192, make it a perfect location for those wishing to visit the theme parks, and any of the other attractions Florida has to offer. We have a locally based Management Company to assist should advice or assistance be required. The formal living room / dining area has a 40 inch HD TV with surround sound system, with cable channels and is beautifully furnished. The formal dining table has seating for six but could easily accommodate a further two persons. An archway leads to the kitchen, breakfast area (with a table for four and two bar type stools) and family room, which has patio doors overlooking the pool deck and a second 40 inch HD TV, with Netflix. The kitchen itself is fully equipped with full oven, microwave, dishwasher, fridge freezer, waste disposal, coffee maker etc together with a full range of tableware, pans etc. 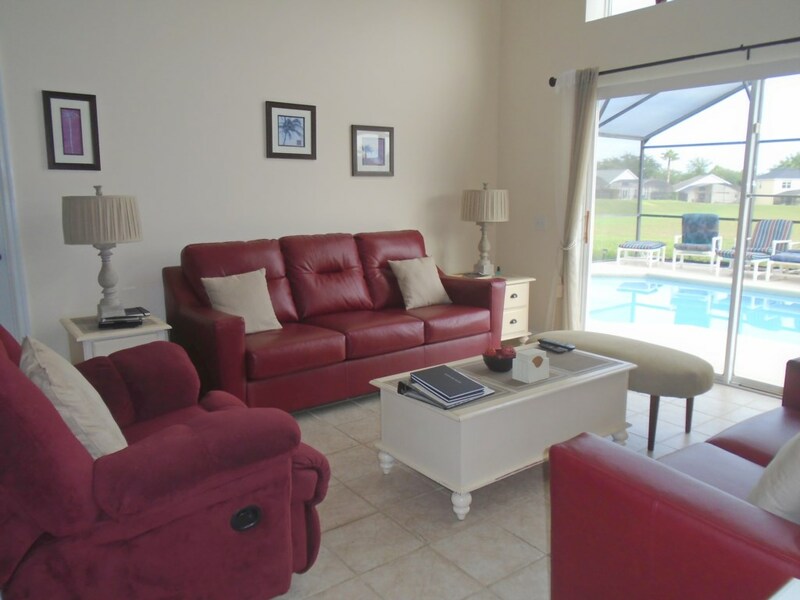 The family room has two and three seater sofas, plus a recliner chair, with patio doors leading onto the pool deck. The formal lounge / dining area creates additional space for the larger family. 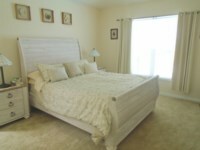 The master bedroom is spacious with it's own private bathroom, with walk in shower, separate wc and large corner bath. It has a king size (US queen) bed, with pillowtop mattress. 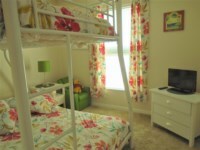 The guest bedrooms have a king size bed, two twin beds and a twin over double bunk bed. 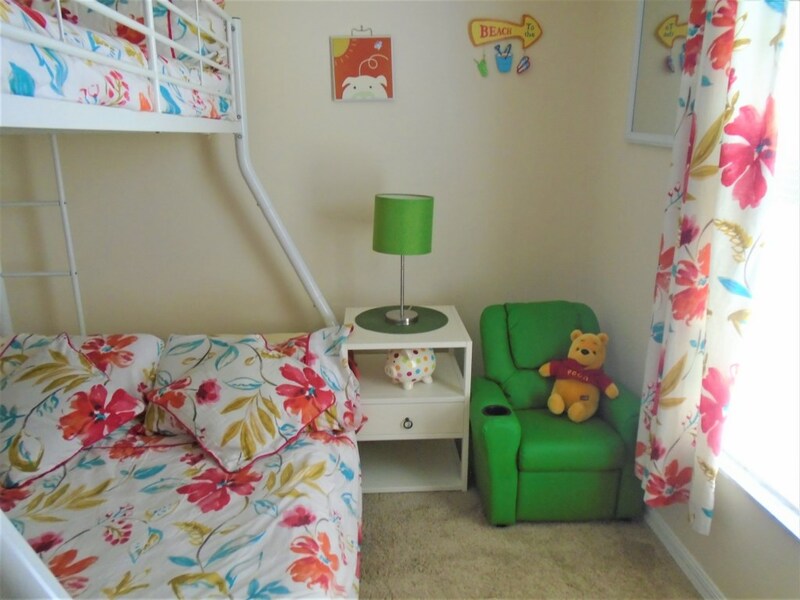 We can also cater for infants, with two travel cots, a highchair, safety gate and stroller. 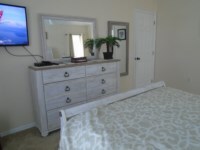 All bedrooms have 19 inch HD TVs. 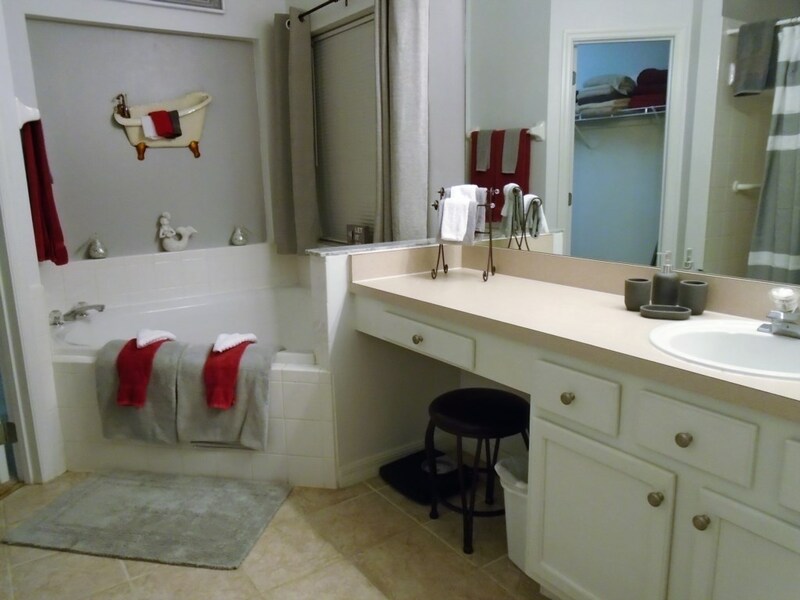 The guest bathroom is bright and cheerful and has an overbath shower and vanity unit, and also gives access to the pool deck. Externally the pool area is fully screened and the pool itself is approximately 25 feet long. It can be heated during the winter months (additional charge applies). We have a number of all weather recliners, loungers and footstools, together with a patio table and chairs (for those relaxing days off from the parks!) and the extended deck makes sure that there is room for everyone. There are two barbecues, one gas and one charcoal, for use of guests. 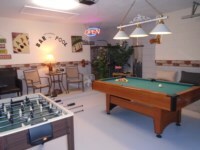 We have also converted part of the garage into a games area, with a pool table, Foosball game and electronic darts board. There is also a small utility room with washer and drier, plus ironing facilities. We provide all linens, towels, including beach towels, as standard, also hairdriers, straighteners, Sat Nav, free wifi Internet access, and we also have a collection of CD's, DVD's and books - in fact we have tried to provide everything needed to make it a perfect holiday for our guests. We have numerous 5 star reviews,(some shown below) to prove that we are getting it right! As advertised and more ?? This is a beautiful home in a quiet neighborhood. My husband and I stayed here with two of our daughters, 2 grandsons, and our daughter’s friend. With 4 bedrooms there was more than enough room for everyone. Julie does a fabulous job keeping the place sparkling clean. She even stopped by to finish a load of linens and introduced herself. The home was well stocked with towels, linens, cookware and dishes, movies and books. Even toys for the little ones. 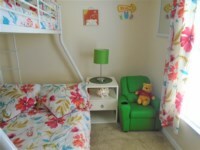 The beds were comfy and the rooms were beautifully furnished with lots of storage. And I haven’t even mentioned the pool yet ???? And the game room!! The kids had a blast in the pool. It was nice to get in anytime we wanted. Sandra was very easy to work with, nice and quick to answer questions about booking and such. She sent us easy to follow directions to get to and into the house. Will definitely be looking to book again! Loved it and will definitely book again! 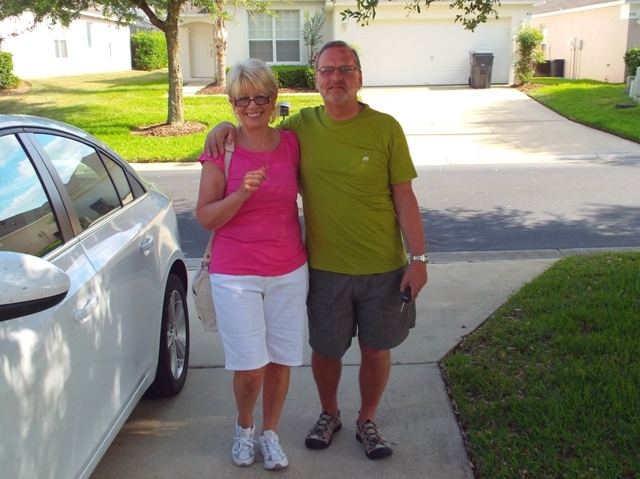 5* - This is a lovely property and really is a home from home - Sandra and Jeff have thought of everything! 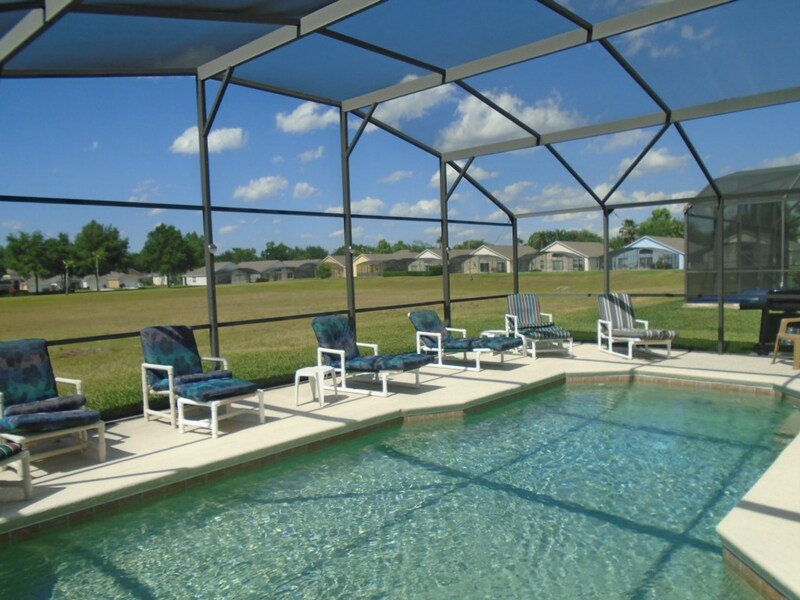 It has everything you need to relax and live like a Floridian for the duration of your holiday. 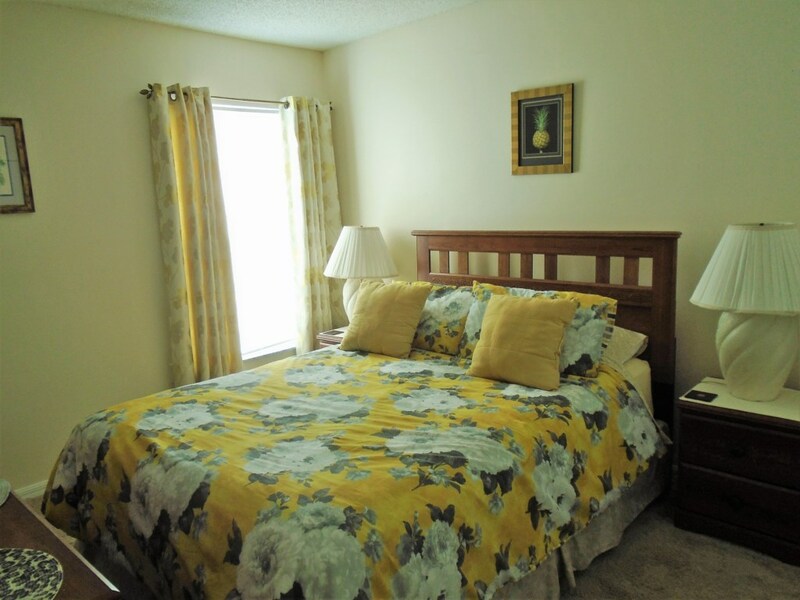 It is a good size with two lounges, four bedrooms and two bathrooms. The pool area is lovely and because of the extended area there are plenty of sunbeds to go around. We loved the fact that we could still access our favourite shows on 'Netflicks' - the perfect way to unwind at the end of a busy day shopping/visiting the theme parks without the annoying adverts interrupting every few minutes! The villa is on a quiet and clean estate, and is easily accessed either from the 192 or the I4. I recommend this 'home from home' to anyone - you won't regret it - thanks Sandra! 5* - From the very beginning of booking the villa, Sandra was so helpful with any querys we had and was always quick to respond to my emails. The Villa itself is perfect and equipped with anything you could possibly need! My son made good use of the pool and it was nice having all the space around the pool to chill out when we were not in the parks. It also felt very safe being a gated community. Thank you so much for a wonderful holiday! We absolutely loved our stay. The kids loved the pool and game area. Located close to Disney. Everything about our stay was perfect! 5* - This villa is probably one of the best equipped villas we have stayed in, and we have stayed in quite a few. The pool area is large, and there are plenty of pool loungers and seats. The villa is spacious and comfortable. It is spotlessly clean and decorated in a Floridian style. 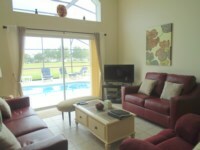 The location is great, with easy access to I 4 and US 192. There is a Publix, bank, and other shops and restaurants within a couple of miles. The gated community is kept tidy and secure, and the community centre hosts social events to which everyone is made welcome. Overall, this is a great place to stay in Central Florida, and I would happily recommend it. J & B J., January 2018, Wales, UK. Wonderful for a family or a couple for a get relaxing getaway. 5*- It was more than I expected!! Extremely clean with so many wonderful extras that made our family stay so enjoyable! After long days at Disney and Universal we could relax in the heated pool and play a few games of pool. I didn't want to leave! Wow – so close you can hear the fireworks!!! Palm Tree Villa is Sandra and Jeff s home from home in which they were gracious enough to let us stay. It is furnished and equipped brilliantly with everything you could want and while this trip was just the two of us we were so impressed with the space available we have already booked Again to bring the whole tribe. Many villas say they are close to Disney, well this one certainly is as we could hear the fireworks every night, but not in an intrusive way. The fact that there are two fully equipped and comfortable living areas means that there is plenty of room for everyone to relax and enjoy their stay. We have stayed in many Villas where there is ample room to sleep but restricted living area, not in Palm Tree Villa, room for all. Plenty of space around the pool for everyone to relax and a superb games room if there are any Disney rain days. A hire car is a must but there are nearby take aways who all appear to deliver, and a Publix only minutes away. We prefer a little bit of peace and quiet and this was perfect for us, close enough for easy access to all the attractions but not too close. The fact the community is gated gave us an added sense of security and we quite like the mixture of local residents and visitors. 5* Well,where to start. We are a family of 4 - 2 adults 2 children and we took my mam and dad. We have never done a villa before so where a little skeptical but omg villa all day long especially this one, beautiful condition beautiful decor a home from home with all the frills, heated pool , games room, big bedrooms and a living room and a lounge, the owners are nothing but very helpful and a pleasure to deal with. We would definitely recommend 100% not to far from all the parks. thank you Jeff and Sandra for a wonderful stay from the Peacocks. We have just spent an amazing three weeks at Palm Tree Villa. 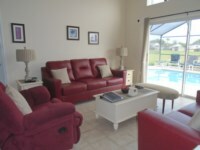 The villa is furnished to a high standard, is extremely comfortable and the pool area was enjoyed by all. The Wifi came in very useful to our teenagers and our football mad son made full use of the Cable TV! Netflix is available if you need some chill time after the parks. Anything you can imagine is provided - towels, plug adapters, hairdryers, straighteners, sat nav, books, dvds, etc. The location of the villa is ideal with the theme parks 20 to 30 minutes away. There are supermarkets, restaurants and take-away's all in the vicinity. Beaches on both coasts and easy to get to and take just over an hour. Booking was very straight-forward and the owners are very approachable and helpful. Thank you Sandra and Jeff for letting us use your villa and we hope to be back soon! This home was wonderful from start to finish. Extremely close to everything without having to stay in a busy city. You feel as though you've arrived home as soon as you walk in. Beautifully and comfortably decorated. The entire family had incredible time. Recommend to anyone looking for a relaxing vacation. 5 stars. Amazing Villa, Fantastic Location, very friendly and helpful owners!! This Villa is fabulous!! The villa provides everything you could possibly need - and more (a satnav was even provided!!). The location of the villa is perfect, we were right in the middle of everywhere we wanted to go whether it be the Disney/Universal parks, Cape Canaveral or Clear Water Beach. The owners are brilliant - so friendly and helpful, advice was plentiful and much needed and any queries we had about the area or anything else were answered swiftly. All in all I couldn't recommend Sandra and Jeff's Villa highly enough!!! This was our 4th time staying at this villa and the first time for just the two of us on our own and it was as perfect as ever. Everything was catered for as usual. It's In a great location with shops, bars and restaurants close by with a new Ihop down the road which is great for breakfast and Chilis for some great food after a fun packed day. Both of which we tried for the first time this year. There is always something new to experience! 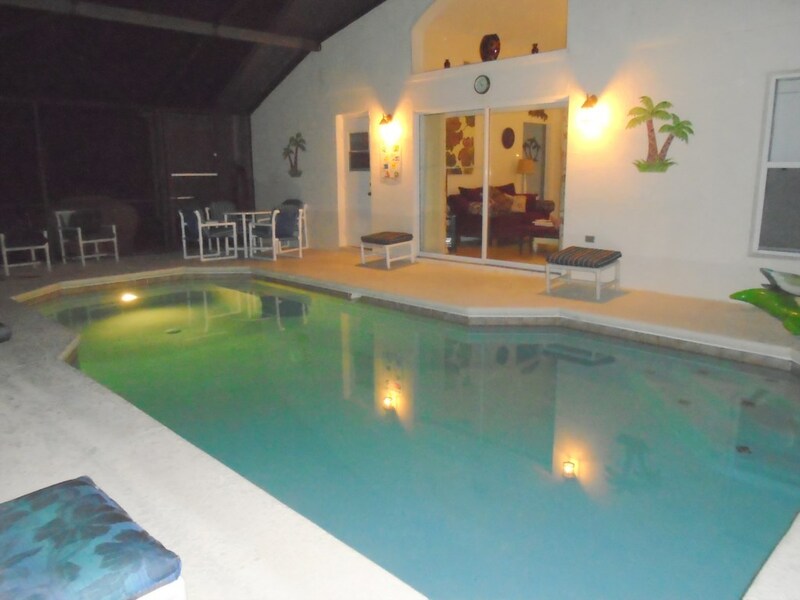 I have recommended this villa to everyone as it's a perfect place to stay when visiting Florida. I wouldn't want to stay anywhere else. Can't wait to book for our next visit! This was our first visit to the States and Jeff & Sandra’s place was exactly what we had hoped for. The villa is very spacious with everything you could possibly want. Sandra has tried to think of everything and it was reflected in our stay. The villa is large and well laid out with excellent furnishings throughout. The kids loved the pool and the location for Theme Parks, Nasa, Air Boats, the Gulf and other activities couldn’t have been better. After days out it was a great home to return to. The gated estate is spacious, quiet and very well kept. Being only a short drive from shops and amenities was a real bonus. The help from Sandra before leaving home was excellent, she replied to any questions both very quickly and courteously, she couldn’t have been more helpful. Top marks for both the owner and property. Would we go again, you bet. Everything about the stay surpassed our expectations, just book it and enjoy. Thank you Jeff and Sandra for making our trip to Florida a lasting memory and holiday of a life time. Having never travelled to America before you helped us from start to finish to ensure that everything was in place to make the holiday hassle free and thoroughly amazing. The villa is very clean and comfortable and the kids loved the pool especially after a hot busy day sight seeing. The villa is ideally placed for all the main attractions Disney world, Universal, Seaworld, the water parks and then further afield Busch gardens which the kids enjoyed the most and Kennedy space centre. Supermarkets and shops are all in easy reach and there is an abundance of great restaurants. Thanks for recommending 'Manny's' chop house, the ribs were to die for. If we were going to return to Florida in the future we would definitely want to stay at yours again. Thank you for everything. We stayed at Palm Tree villa in May/June 2016 and it was absolutely perfect. We stayed as a party of 4 adults, and 5 kids. Great living space, with two lounges so we could watch something different to the kids on a night. The kids loved the pool, probably more than the theme parks, which were really easy to get to from the villa. They also loved the games room and had loads to occupy them while us adults had time to chill out! The villa sits on a lovely quiet gated estate, pool has a private outlook and gets the sun all day. It had everything we needed, a home from home. Sat Nav was particularly useful to navigate to our destinations. When we arrived, the villa was clean, very well presented, and Sandra (owner) provided lots of great information on the villa, surrounding area and recommendations for food, days out, and lots of other tips. She was also very responsive to emails while we were there if we had any questions. Overall a fantastic holiday, and I would wholeheartedly recommend palm tree villa as an excellent place and location, especially for families. We had an amazing time at your villa. Everything was as we expected from your advertisement. The kids were so sad that this amazing trip has come to an end - we had to beg them to get out of the pool every night. Your villa is very welcoming and we enjoyed every moment of our stay. Thanks again, we hope to visit again soon! This was my second stay having stayed there about three years ago. 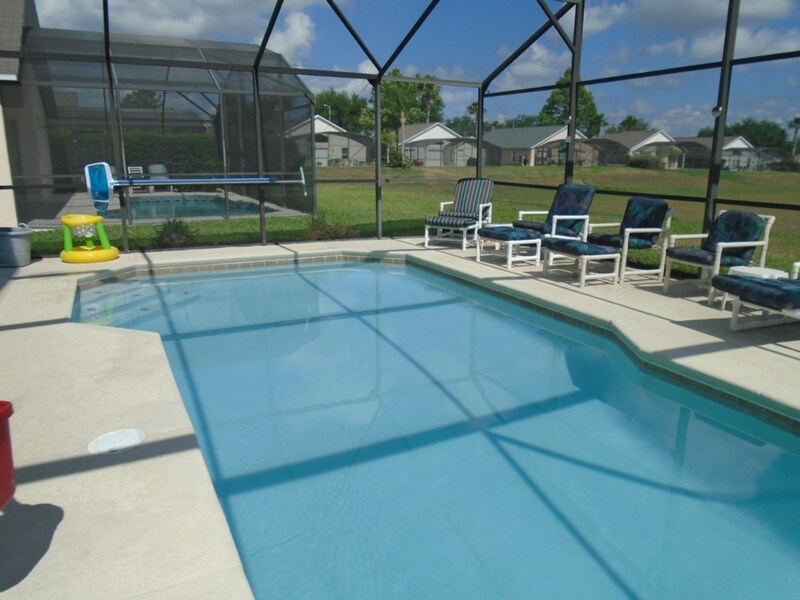 The accommodation is the ideal family orientated place to stay when visiting Florida if you are going to the parks or anywhere else in the state. The house is large, very well equipped and a home from home. 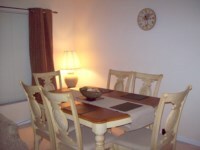 Sandra has thought of everything that you may need to make your stay great with, Wi-Fi, heated swimming pool, games room in garage, two living room areas with fully equipped smart TV's, Sat-Nav, tourist guides and info on best places to eat and visit, there is even sun tan lotion in the cupboard!! I would have no reservations in recommending anyone to stay here and make your Florida holiday special. Fabulous villa! Everything you need when on holiday, felt like home straight away! Can't recommend this enough! Fab location to Disney, Universal and Sea World. Wow what a fantastic villa . We have stayed in Sandra and Geoff other villa which is beautiful but this was our favourite. 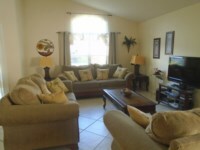 Easy to get to from the airport about 30 minutes and located on a beautiful gated community. The villa surpassed our expectations. 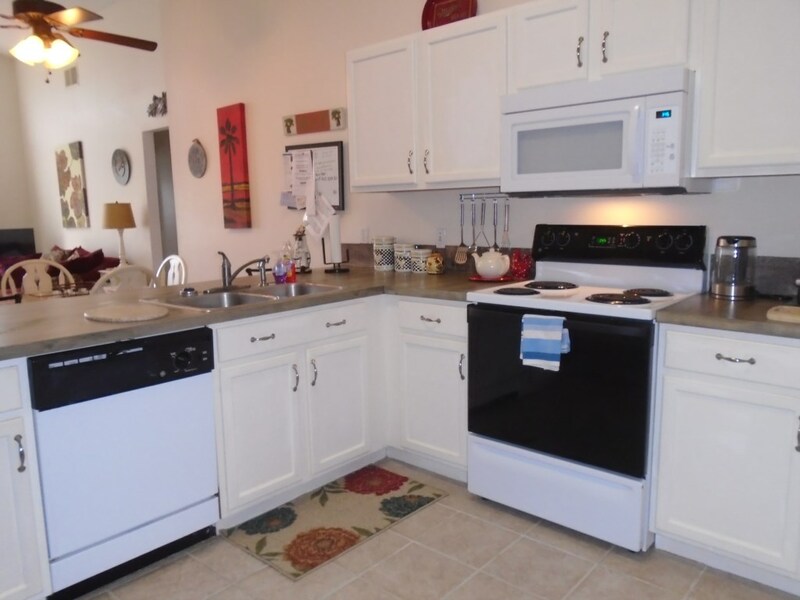 Two large family areas , a great kitchen and four bedrooms. Games room in the garage which we didn't use but looked great for a bit of fun. The pool is to die for after a busy day, can't beat it. This villa is probably situated in the best area as it is easy for the parks , shopping and a drive to the beach. Sandra and Geoff you should be proud , what a fantastic home you provide. Love it love it love it. Thank you. Upon our first contact with Palm Tree Villa's owner, Sandra, we knew we picked the perfect house to stay while visiting Universal Studios. Her customer service was the highest quality. Her communications were so polite, very timely, organized, and detailed. She thought of everything so that we would be prepared for our arrival, stay, and departure, and be able to enjoy our stay without any worries. We were amazed with this beautiful and absolutely spotless house. 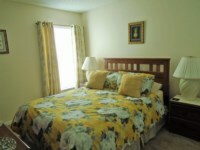 Everything was very clean and wonderfully decorated and furnished. We were most comfortable staying there and felt as if it were our home away from home. Having two separate family areas with a tv in each was very appreciated. Having a second door in the guest bathroom to the pool area came in very handy. The variety of bed sizes were perfect for our family. And having the master bedroom separate from the others was nice. The pool was very refreshing after long days in the park and the games room was super fun! The location was great and being in a gated community was a plus. 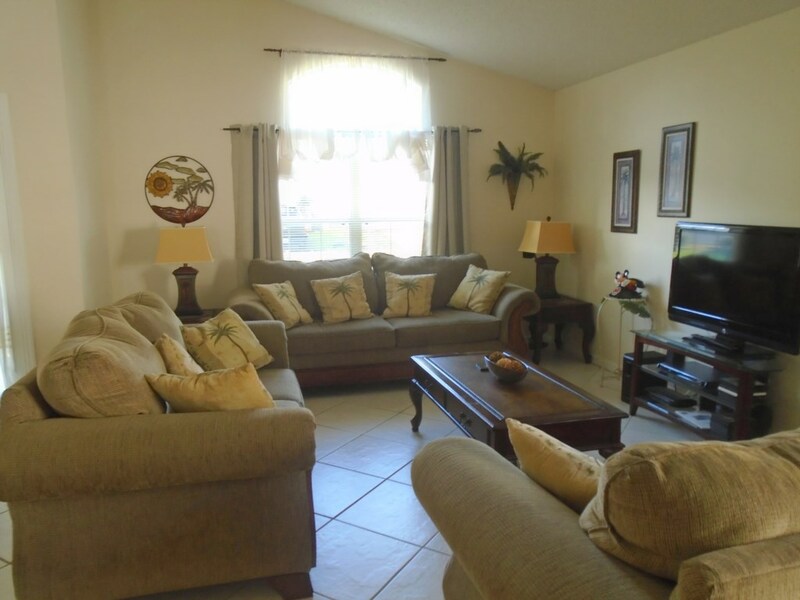 Palm Tree Villa has all the amenities and more that you could possibly need during your stay. The owners have thought of everything. We especially appreciated Sandra's kindness in sending us our very important personal items that we had been searching for, but had not realized we left them at her house. She contacted me and offered to mail them to us after another guest found them. We sincerely value their honesty and kindness. Palm Tree Villa is absolutely fabulous, and perfect in every way. You will not be disappointed in any manner! 6th October 2014 - An absolutely fantastic villa in a beautiful community. It has everything you could need and more. 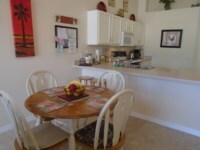 It's in a great location and is close to all the big attractions. The pool deck is a perfect place to catch some sun and just relax after your busy day at the parks. We went in October which hosts Universals Halloween Horror nights, which was amazing! The villa is also close to a Publix and Walmart for all your shopping needs. An all round perfect villa in a perfect place that you want to visit time and time again. Home from home, fantastic villa! 22nd Sept. 2014 - My husband, daughter and partner and I stayed for two weeks. Sandra had thought of everything to make our stay a pleasant one, the villa was of a very high standard, plenty of room and everything we could have wanted, the games room was a plus. I have stayed in Florida on six occasions, always renting a villa and this one has outshone the rest. Sandra was easy to contact with a very prompt reply and very helpful advice. It was set in a nice gated community and central for all our needs. Would highly recommend to others. Will cater well for larger groups due to the space, I know that when we go again this will be the choice that we would hire - excellent price, location. 8th Sept. 2014 - This really is a fabulous villa. Sandra and Jeff have worked hard to create a superb home away from home. We were a family of six who enjoyed the open spacious design. The rooms are all individually furnished to an exceptionally high stabndard and the beautiful matching linens in all the rooms give a very luxurious feel to this place. Our whole stay was excellent and we would certainly like to stay here again. 24th August 2014 - We stayed for a week with our two teenage boys in August. This was the first time we had ever booked independently and from the moment we did we were very pleased with our choice. Sandra contacted us within minutes to confirm our booking and was in contact throughout the build up to our stay with lots of useful information. On arrival we were extremely pleased with the villa, it was all we had expected and more. It was clean and very tastefully furnished. Sandra and Jeff really have thought of everything, making it a real home from home. We would highly recommend this villa and thank you again Sandra for your very professional and friendly service. Hotel Luxury With real Home Touches! 24th July 2014 - This is a really spacious and well furnished villa set in a beautiful gated community. The owners have anticipated every requirement their guests may have , even creating a games room in the garage and providing an extensive reading library. 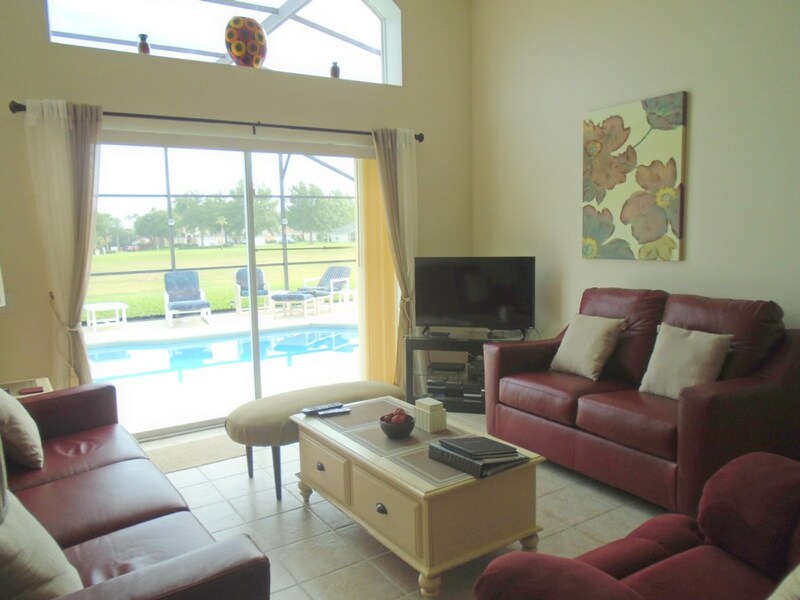 The villa is so comfortable and the family room provides a homely space to relax after a log day hitting the parks. The pool and deck area also provide ample space to relax and sunbathe if you are having some downtime. For those who feel the need for a more strenuous exercise regime a trip across to Manors North and the larger swimming pool and gym at the clubhouse is worth the short walk. Detailed information on the facilities available close by and in the surrounding area is contained in a file collated by Jeff and Sandra. The recommendations of eating places in the guest book are invaluable and a place not to be missed is Manny's Chop House at Haines City. Any problems encountered with the property are resolved with a quick call to Greg or Julie who look after the villa on Sandra's behalf. They are really helpful and friendly as we can testify after meeting both during our stay this time. The villa provided us with a great base for our stay with everything on hand or within a short drive. A good choice of supermarkets and eating places are on the doorstep along with those more famous brands a short drive away at Premium Outlets. All in all a great home from home holiday which allowed us to go at our own pace whilst definitely not compromising on luxury or quality. Thank you Jeff and Sandra! Please note that if pool heat is requested, there is additional charge of £10 or $18 per day, (minimum of 5 days applies). For stays of less than 7 nights a cleaning fee of £70 or $95 is required. Your enquiry will be sent to villa ref 3550 only. This page has been viewed 8843 times since 22 Jan 2015.